I've been traveling with either a recent 12" MacBook or a 15" MacBook Pro for the past two years. That means that I've been in a bit of dongle hell. The 12" has one USB C port, the 15" has four. But that's all they have for ports, and power has to be plugged into one of those. My current cameras shoot with XQD or SD cards. Two card readers needed. I project so students can see what I'm doing. HDMI port needed. I often need to take images from someone or share them with them via USB stick. Another port. 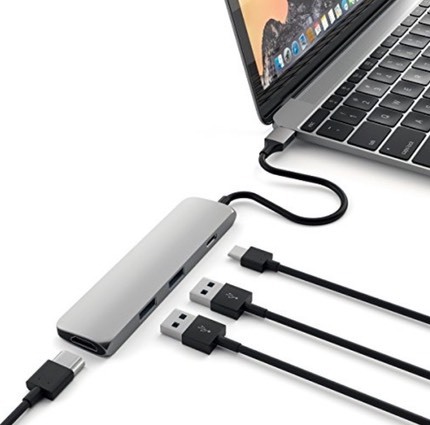 You need one of these for a 12" MacBook, and you need to make sure it has at least a USB C power pass through, an SD slot, and a couple of standard USB 3 connectors. Some don't all have these things, and you have to make sure that the power passthrough is strong enough for the computer you're connecting (most all of them are for the 12" MacBook). The nice thing is that this solution looks really clean in use. It's basically like having a small sidebar table on the computer that has the connectors Apple left off. Here's the thing: the type of one-connector dongle I just showed? It has a slight tendency to bend when you apply pressure at the non-connector end. I don't trust that it won't eventually bust my computer's connector by being forced up and down accidentally. Thus, I can't totally recommend this approach, though I still use it when I'm trying to be ultra portable. Especially once I found a sleeve for the 12" MacBook that allows me to leave the dongle on. So we move on to a cabled dongle. A number of makers produce variations of this. 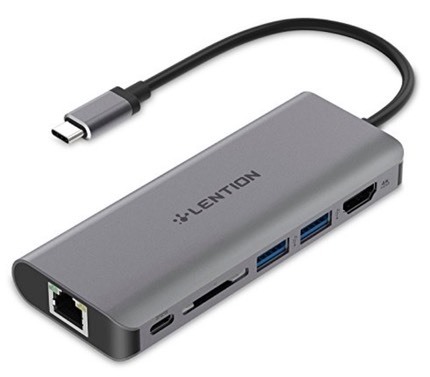 This particular one has HDMI and Ethernet, making it a true one-dongle approach, and yes, it does pass thru power. We're getting a little pricey at US$70, though. Still, this is the right approach, IMHO. This Satechi variant [affiliate link] is the one that I currently use, and runs about US$55. Which brings us to the 15" MacBook Pro model (and now all 2018 13" MacBook Pros). The thing you have to watch is that the power pass thru may have a limit. For instance, on that Satechi that I use with the 12" MacBook, it has a limit of 49W, which means that it can't keep charging a MacBook Pro 15" under heavy load. That might not be a problem for you, but it can be if you're doing heavy video editing and trying to keep the battery fully charged. Satechi, who I've found makes excellent Macintosh accessories, has one of those, too. If you're going to use the side-bar variation, does it fit truly cleanly on the MacBook? You want the side-bar to be exactly the height of the MacBook surface, and the USB C plug properly aligned. Most are, but don't accept one that isn't, it'll become a problem. Return bad fits before they give you a fit. 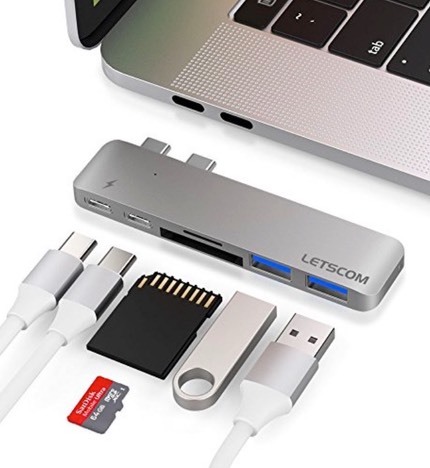 You absolutely want a pass thru power port (USB C). Watch what the power delivery for that port is. The top end MacBook Pros really need 61W, and I'd opt for higher than that if available. The 12" can get by with 29W, though again, higher gives you some breathing room. Are the USB 3 ports on the dongle really 5Gbps in transfer speed? Indeed, are those standard USB ports even 3.0? Make sure. I've seen some cut rate dongles that cheat. If you've opted for an HDMI port, make sure that it can really pass thru 4K video, and that it isn't an older standard that only allows 1080P. That's especially true now since all these MacBooks have Retina displays. They can throw out far more pixels than 1080P. Make sure the Ethernet port is at least Gigabit. The temptation is to run lots of dongles into the four ports of the MacBook Pro (two on the 13" models). Don't. Just get the right multi-dongle in the first place. That leaves those additional Thunderbolt 3/USB-C ports open for accessories coming along that require those ports. Also, pay some attention to where the cables will be coming off the dongle. I actually use my one dongle backwards from the way they designed it (logo is face down on the table because it's on the right side of my MacBook Pro instead of the left ;~). Why? Because then the cables slink off the back away from me, not all towards me causing me to constantly move things around on whatever surface that's my travel desk at the time. Like everything in life, more is better. Wait, what? Don't skimp here. You'll buy a dongle with two USB 3 slots and an SD card reader because you think that's all you'll need and that dongle is a little smaller. Trust me, there are small dongles with a full complement of ports, and that's probably what you really want. 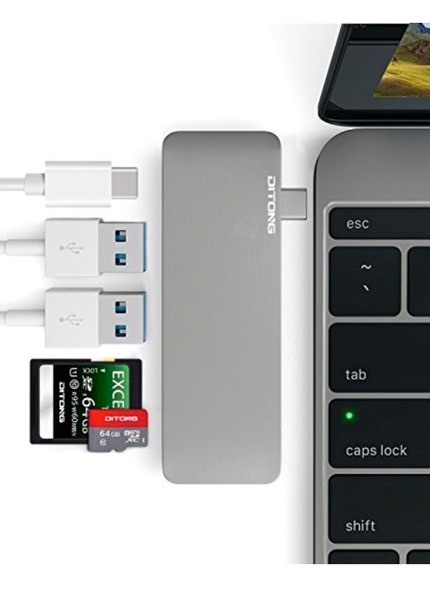 Otherwise you'll end up starting to carry multiple dongles. And that defeats the purpose that Apple is trying to deliver on: small, light, compact powerhouse computers.